« Pacific Coast Ride – What Else? Here’s a chain measurement. 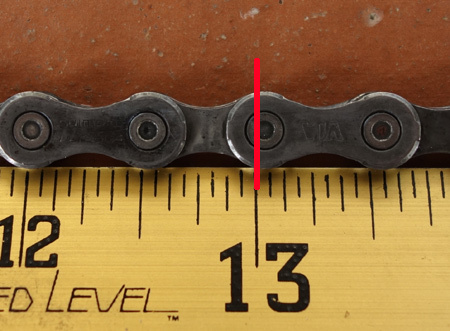 At 12 inches (13 shown here because I started at 1 inch) a worn chain will be 1/16 inch beyond center to center. This one is about 1/32 inch so it has more wear. When I shifted to Shimano Ultegra, minor matters, like the cost of a chain, suddenly took on new meaning. $40-$90 for a chain? I purchased a Park CC-3.2 chain wear-indicator tool and started cleaning my chain with Simple Green more often. I also purchased a second chain so I’d be more inclined to clean my chain, some KMC master chain links and Park MLP-1 master pliers. I read up on the best way to clean a chain as described by Sheldon Brown. I especially like putting the chain in a container with Simple Green and shaking well. I’m pleased to report that the chain is wearing longer than I expected. 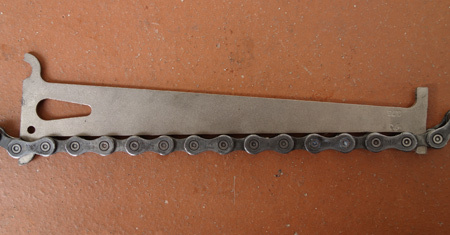 Worn chains will more rapidly wear freewheel sprockets, adding to the cost of maintenance. The Shimano CN-6600 has about 4,000 miles, but it won’t last much longer. Park has two settings, .5(%) and .75(%). It’s at .5 but being the cheapskate that I am, I’ll let it go to .75, which is about 1/16 inch and the recommended wear point for chain replacement according to the experts. While Pardo and others mention that most chain-wear indicator tools push the rollers apart and are therefore “inaccurate” it’s easy enough to measure your chain when the chain-wear tool indicates it’s worn, just to confirm. Of course, measuring with a ruler is subject to error as well. Park no doubt accounted for the roller spread when making the tool and from what I can tell it’s spot-on accurate. Now back to your regularly scheduled bike riding. About 550 miles later the chain wore down to the 0.75 setting. Your mileage may vary. Park chain wear tool makes it easy to judge chain wear. When the tool easily fits into the .75 setting it’s time for a new chain. This entry was posted on March 25, 2013 at 7:56 pm and is filed under Repair. You can follow any responses to this entry through the RSS 2.0 feed. You can leave a response, or trackback from your own site.